Expense tracking, faster billing with auto-save, table management & receipts view in SlickPOS mobile app. Here’s a roundup of the new features we have rolled out to SlickPOS this June. If you don’t see these features in your account, follow these instructions to get the updates. If you run SlickPOS on mobile or tablet, you can get the updates from Play or App Store. If you are new to SlickPOS, signup now and get SlickPOS for free. SlickPOS now allows to track cash expenses that are happening in the store. With this feature, the cash balances indicated in the shift reports are adjusted for the expenses and hence more accurate. Expenses can be created even when the system is offline and they get synced to the cloud whenever network is available. SlickPOS is now faster than ever due to the reduced number of clicks while drafting orders. Now you can navigate across views, and take table orders as they come without having to keep saving manually. Improved SlickPOS mobile app with table management, receipts view, etc. 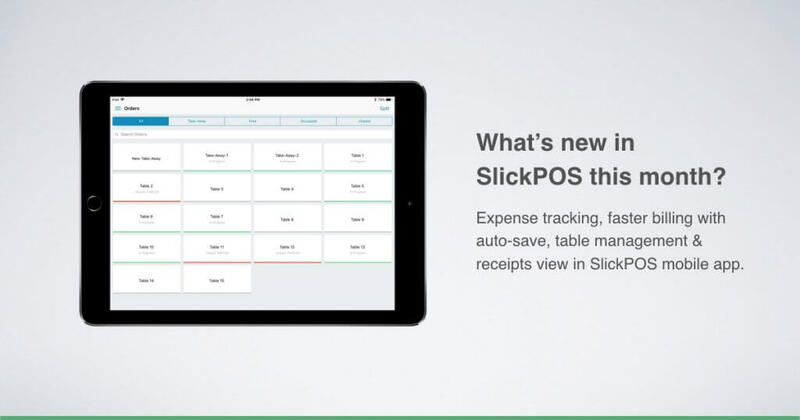 SlickPOS mobile apps (our iOS and Android POS) get a raft of new updates this month. The mobile version of SlickPOS now gets table management, quick billing , shift tracking and also a receipts view. The receipts view allows managers and owners to review or cancel receipts without having to login to the web POS. It’s quite common for customers in a dine-in restaurant to switch tables. With the new table swap feature, you can switch tables and generate KOTs (Kitchen Order Tickets) under the new table. There are situations when you realise the printed bill is incorrect, this could be either due to missing items or incorrect item quantities. To fix this, previously we had to create the bill, cancel it and then make a new bill. But going forward, managers will be able to unlock a printed receipt (that’s pending payment), correct it and then print again. If you already have a CRM and would like to import those customers into SlickPOS, it’s possible now with the customer import feature. Also, we have added import and export options to manage inventory items. We hope that you liked our updates, do send us a message if you have any suggestions or if you would like to see a demo. See you again in July with the next round of updates!